Before each election, the League prepares an independent, nonpartisan Voters’ Guide to give voters reliable information about candidates and ballot measures. League members ask the candidates substantive questions and print their unedited responses in the guide. League members also research the ballot measures by reviewing extensive information about each measure and interviewing the organizations in support and opposition. 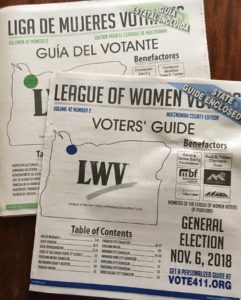 Copies of the Multnomah County Voters’ Guide (printed in English and Spanish-and with the Oregon guide enclosed) are available at all branches of the Multnomah County Library, Portland Community College libraries, Mt. Hood CC, Portland State University Library, Warner Pacific College Library, New Seasons Markets, Loaves and Fishes (Meals on Wheels) sites, the Multnomah County Elections Office, and many other places. Click on the links below to view a pdf of each version of the General Election guides. The League can create a custom guide for you! Go to Vote 411 and enter your residence address to see a Voters’ Guide with information for only those candidates and items on your ballot. 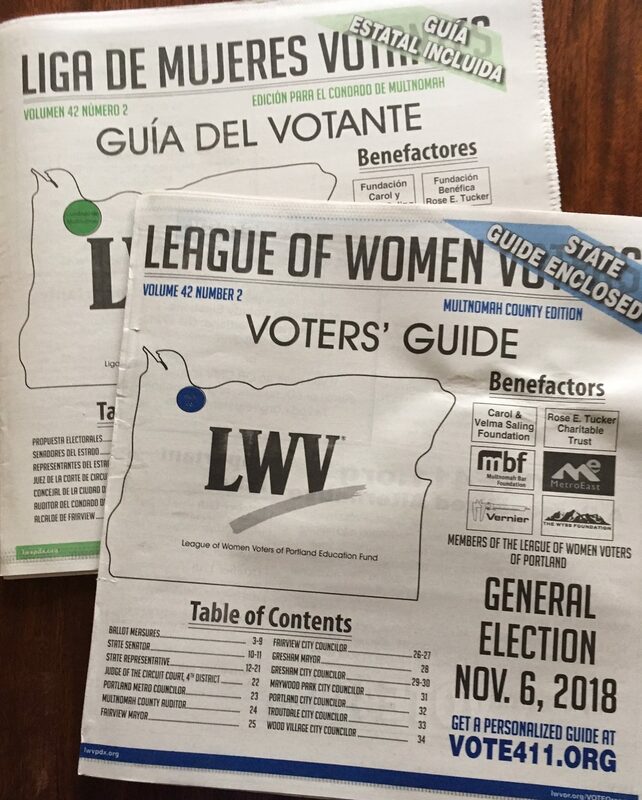 For the January 2018 Special Election on the Measure 101, the Health Care Assessment, the League of Women Voters of Oregon (LWVOR) has prepared a Voters’ Guide explaining the background of the measure and the reasons given by the supporter and opponents for voting “yes” or “no.” You can read that guide by clicking Measure 101 LWV Voters’ Guide. Click on the links below to see electronic Voters’ Guides from earlier elections. Volunteers in our Speakers Bureau are trained to share well-researched, nonpartisan information. Voter registration and the mechanics of voting. Our speakers can help your audience register (or update their registrations) on the spot. Importance of voting and civic participation. Activities and history of the League of Women Voters. Local and state ballot measures (during election season). League speakers are trained to share balanced information that will help voters make informed choices on their ballots. Our presentations provide background information and discuss both pros and cons for each measure. For the November 2008 election, our volunteers spoke to over 950 people at 40 speaking engagements.